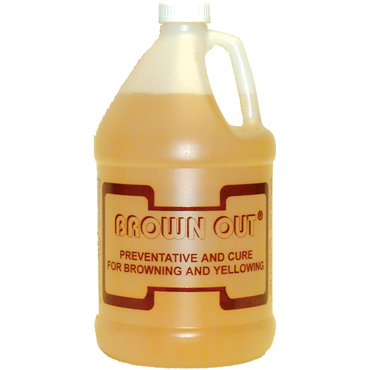 Brown Out® Reduces Browning and Dye Bleed of Carpets, Rugs and Upholstery by Lowering the pH to the Acid Side. The use of Brown Out after wet extraction (steam) cleaning, especially on rugs and upholstery, greatly reduces possibility of browning and dye bleed. When used at 1:2 with water, followed by extraction, Brown Out will remove the yellowing that sometimes occurs on stain-resistant carpets. Formulated with Extracon® to prevent and cure browning or tingeing in carpet and upholstered furniture, Brown Out helps restore the original beauty of the fiber, is economical and ensures a high quality finish to your service. Brown Out contains no phosphates, phenolics, bleaches, solvents, hazardous hydrofluoric acid or other fluorides. Brown Out, containing organic buffered neutralizing acids, is very effective for treating carpets, rugs and upholstery that have been exposed to excessive amounts of shampoo, detergents, powder cleaners, ice melt compounds and other residual matter. 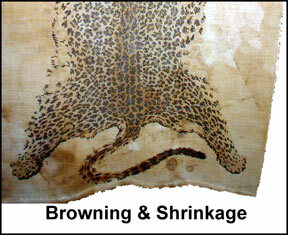 Brown Out Reduces Browning and Dye Bleed on Rugs, Upholstery and Some Carpets. Brown Out should be applied to ALL wet-cleaned rugs & wet-cleaned upholstery! What is carpet and rug browning? Browning is a phenomenon in which, after the carpet or rug is cleaned and has dried, the fiber tips turn dark. Carpet dries from the tips. Therefore, as the cleaning solution evaporates from the tips, the water rises to the surface bringing with it everything dissolved in it, and then the water evaporates leaving everything else behind as illustrated above. This leaves on the tips of the carpet, rug or upholstery soil and high-alkalinity residue plus anything else left in the carpet such as high shampoo levels, cola, coffee, etc. This upward flow of moisture on fiber surfaces during drying is referred to as wicking. The factors contributing to browning are slow drying, over wetting, high alkalinity (high pH), BHT, and cellulosic material (jute backing). In the beginning of this industry, most detergents used were nothing more than glorified concrete floor cleaners, which are highly alkaline and frequently caused browning. Carpets and carpet backings were not as good then either. Equipment now does a better job of leaving the carpet dry. Most carpet-cleaning professionals are now better trained and most (but not all) know better than to over wet a carpet or to use overly strong detergent solutions. Also, the carpet manufacturers now rarely use jute backing. Cellulose browning occurs in natural fiber carpets like jute, wool, sisal, cotton and can also happen in some old carpeting when jute backing was used. Read label and Safety Data Sheet before using. Avoid contact with acid-sensitive materials such as limestone, travertine and marble. Form: Clear colorless to slightly amber liquid. Manufacturer: Bane-Clene Corp.®, StoneTech® / Laticrete® International. How to Cure Carpet Browning? An application of a formulated organic acid agent such as Brown Out will neutralize this residue not only preventing browning, but actually leaves the carpet cleaner and brighter. Additionally, the use of Brown Out on wet-cleaned upholstery and rugs will reduce the likelihood of dye bleeding by setting the dyes. It is easier to correct browning on carpet with pile yarns made of synthetic fibers than of natural fibers such as wool, hemp, silk or cotton. 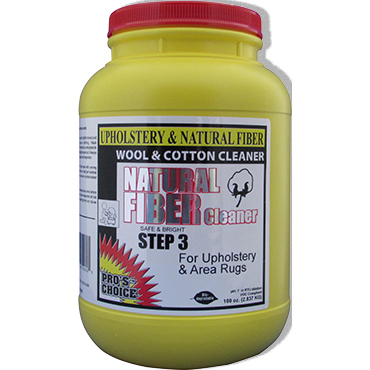 In cases where severe browning may occur, clean the carpet with Natural Fiber Cleaner (See below). To cure the yellowing from an overly aggressive detergent, rinse with water to remove the excess detergent, apply Brown Out diluted 1 part Brown Out to 2 parts of water (43 ounces per gallon) to the affected areas (even undiluted if severe), allow to work on the yellowing for 15-20 minutes, do a single wet pass with just plain water and 2 dry passes. 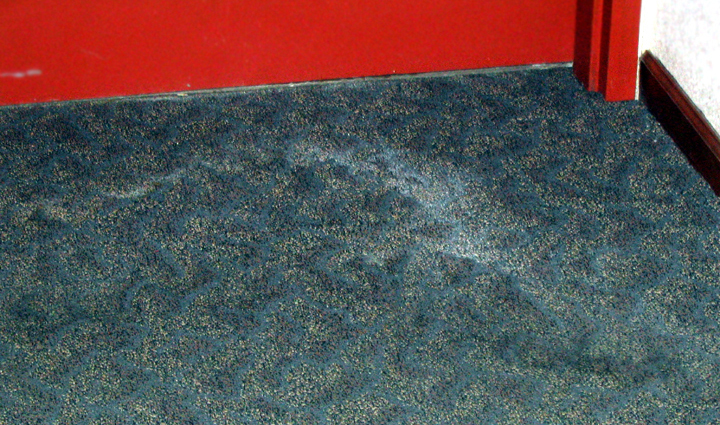 Since the stain resistance has been destroyed, apply Bane-Guard® or Teflon® protector to the carpet. However, the stain resistance warranty has still been voided! BHT (Butylated Hydroxy Toluene) is a common slowly vaporizing preservative used in many plastics including rebound pad. It is even used as a preservative in bread, because it performs well against free radicals. Most of the problems have been on carpets in areas of low air circulation such as in closets, under low-lying furniture, or under throw rugs. In this photo supplied to us by Beaulieu of America, you can see that the entire carpet has yellowed except where the tackless strip is - and where there there is no pad (cushion) under the carpet. However, this problem can occur out in the middle of the room. 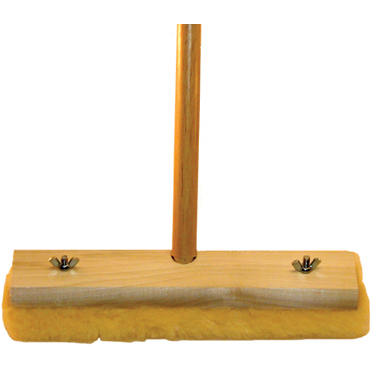 Sometimes, most of the carpet will have yellowed except along the baseboard or directly above seaming tape. This problem seems to occur more frequently in the winter in homes using fossil oil or gas heat. Most carpet manufacturers will not accept this as a claim since it is basically a cushion problem.To cure this problem, most fiber producers recommend a 10% solution of citric acid to remove BHT yellowing, followed by vacuuming. The primary acid in Brown Out is citric. Using Brown Out at 1 part product to 2 parts water will cure this condition. Simply spray the affected area heavily with this solution, allow at least 15 minutes for the yellow to disappear, and do one single wet pass with water (no detergent) and two dry passes. This removes the excess Brown Out but leaves enough behind to reduce the likelihood of the yellow reappearing. Calcium chloride is used in place of sodium chloride (salt) when the temperatures are extremely low when salt no longer performs to melt ice. Calcium chloride is hygroscopic (draws moisture) and turns to calcium hydroxide (lime) when you try to clean with an alkaline detergent. The white powder from calcium chloride ice melt will very quickly track throughout a building and, since it is hygroscopic, causes severe soiling. Quick removal is important! If dry, thoroughly vacuum first. If wet, absorb or extract. 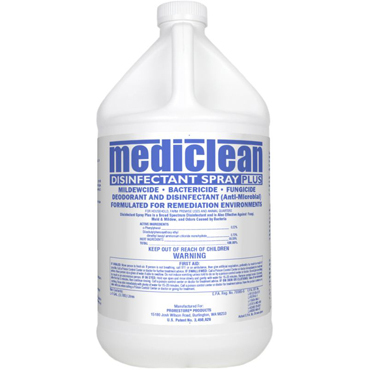 For large areas, extract with a 4-8 ounce per gallon solution of Brown Out in water (with no detergent) through the base unit or a portable extractor. Use long walk-off mats to prevent further track-in. Do a Brown Out flush (acid rinse) by rinsing the carpet with a 4-8 ounces per gallon solution of Brown Out in water with no detergent through the base unit to remove the water ring. The image to the right shows water that leaked onto a carpet from an adjacent room. This is AFTER cleaning with detergent! A Brown Out flush will remove this residue. 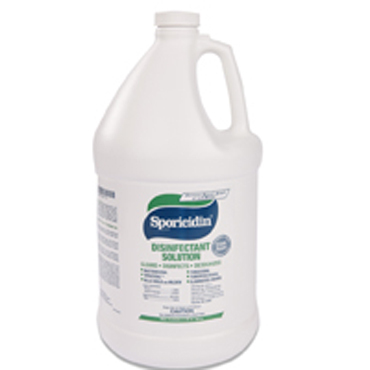 Use MediClean® (Microban)® (see below) or Sporicidin® (see below) to prevent mold and mildew. We STRONGLY recommend applying 8 ounces per gallon solution of Brown Out in water to all wet-cleaned upholstery after cleaning to prevent browning, to stabilize and brighten colors, reduce the chance of dye bleeding and to provide a soft hand. Since dyes are more stable on the acid side, this greatly reduces the possibility of dye bleeding. 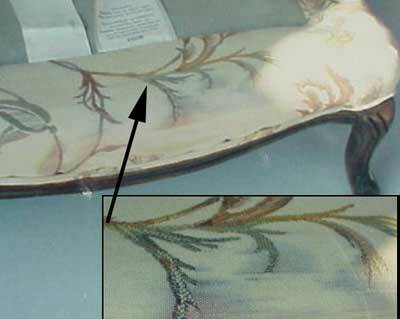 Notice the picture to the right of a chair with inset showing dye bleeding after cleaning because the chair was not treated with Brown Out after cleaning. After cleaning the rug, apply Brown Out at 8 ounces per gallon to the rug - very lightly just to the surface. If, in spite of your best efforts, the rug severely browns, do a Brown Out flush on the rug and allow it to dry upside down. This moves the browning to the back of the rug. NOTE: If pre-testing of a wool rug indicates it will bleed with normal cleaning, test with LCA® 256 or Brown Out. If it still bleeds, it must be dry cleaned, cleaned with Natural Fiber Cleaner (see below) or not cleaned at all. pH - What is it?